2017-18 Golden Torch Award Winner for Academics. Shot very well from 3-point range, shooting 43.3 percent (13-of-30). Shot 45.8 percent (22-of-48) from the floor overall. Totaled five points in 11 minutes vs. Little Rock (3/17/18). Had six points on two 3-point field goals vs. Clemson (2/15/18). Went 2-of-2 from 3-point range in win over Virginia Tech (1/14/18). Totaled seven points, including two 3-pointers, vs. Miami (1/11/18). Career-best 14 points, including four 3-pointers, in 24 minutes at Clemson (1/4/18). Added four points and four boards in 11 minutes at Grambling State (11/19/17). Scored seven points (3-of-4) with four rebounds at Jacksonville State (11/12/17). Raised her game in the summer 2018 at the FIBA U20 Women’s European Championship, averaging 20.9 points and seven rebounds. Posted a 34-point performance against Lithuania in the group phase of the FIBA U20 Women’s European Championship, going 11-of-20 from the floor with eight 3-point field goals. Finished first among all players at the FIBA U20s with 6.3 made free throws per game while placing second in points. A 5-foot-11 guard with immense versatility, showcasing an excellent combination of long-range and mid-range shooting while also being able to drive efficiently to the hoop. Considered the top young player in Great Britain with an excellent basketball future. Ranked 52nd overall by ESPNW Hoopgurlz and 17th overall at the guard position. 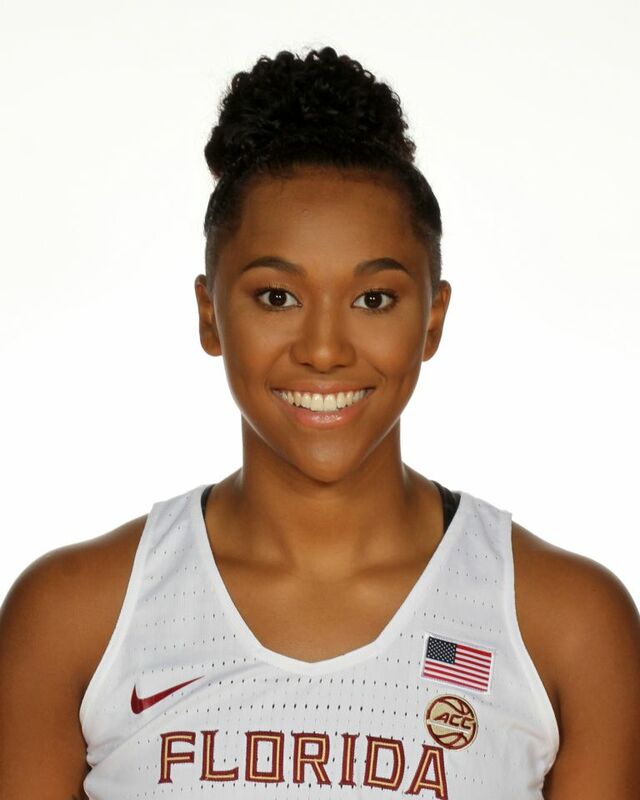 The third Seminole in the last year who carries Senior Women’s National Team experience after being called up to Great Britain’s top-level team in 2015, joining Leticia Romero and Leonor Rodriguez of Spain. Played for the Great Britain Senior Women’s National Team at the EuroBasket 2017 Qualifiers, averaging seven points, six rebounds and 1.5 assists in a loss to Italy and a win over Albania. Product of Barking Abbey Basketball Academy, which was founded in 2005 and is also connected to the long-standing school that provides a quality education. Becomes the second Barking Abbey player to compete with Florida State, joining former men’s player Robert Gilchrist(2012-14). In 2015-16, the athletic combo guard averaged 15.1 points, 8.5 rebounds, 1.5 assists and one steal while leading Barking Abbey to the Women’s British Basketball League championship game. Her U.S. college recruitment included a number of schools, most notably Kentucky, Wisconsin and Purdue. Named to the 2016 Molten WBBL All-British Team and earned the Molten WBBL Young Player of the Year in 2015 as a 16-year old, which is open to all players 21 years old or younger. Nearly averaged a double-double, scoring 10.4 points per game with 9.3 boards, in 2015. Competed in the 2015 U18 European Championship where she averaged 8.9 points, 8.4 rebounds and 1.9 assists. In the summer 2016 in Montenegro, she averaged 9.5 points in the U20 European Championship, including 16-point and 15-point efforts against Romania and Montenegro, respectively. Averaged 14.9 points, 11.6 rebounds and 1.1 assists in the 2014 U16 European Championship. Also participated in the U16 Championship in 2012 and 2013. Played for Great Britain at the 2013 Australian Youth Olympic Festival. Parents: Martin and Elisha Wilkinson. Favorite song: “Never Too Much” by Luther Vandross. Explain a hardship you have overcome: My auntie had passed away the second day I arrived at FSU. It made me realize and appreciate that reaching for my dreams will cause me to miss out on significant memories in my family life, but I realized that spiritually I will always be connected. What shows are you watching these days? Friends. Most gratifying thing you have been a part of? At Firs Farm Primary School I got to coach my little brother, and I got to speak to some of the younger girls. Favorite home-cooked meal? My mom’s lasagna – it has ground beef but it’s completely different from American lasagna. It’s not as creamy. Number of brothers and sisters? Two brothers (27, 11) and a sister (20). If I were a genie and granted you three wishes, what would those wishes be? 3. To wish for more wishes. If you were to win the $500 million lottery, what are some of the things you would do? Buy a convertible beatle for my mom, and spend some of it on gadgets because I’m big into technology. What current issue/issues in today’s world most fascinate you? Generally following Brexit. If you could choose to fight for or give back to any cause, what would it be and why? Cancer research. What is the most inspirational story you’ve ever heard? When my older brother got meningitis, he was supposedly an hour away from passing away. He had to get a few of his fingertips taken off, but it was supposed to be even more parts of his body. Thankfully he is still here today. If you could spend an hour with anyone, living or dead, who would it be and why? Right now, my family because I’m away from home.